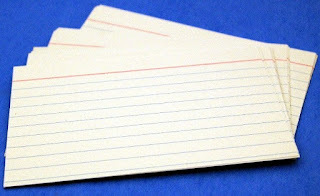 When preparing today's index card, the one that will guide your activities, you may find that the natural tendency is to list tasks related to commitments to others. That's fine, but under a section at the bottom called YOU, list two things that will make you (remember you?) very pleased if you do them today. They may not be capable of full completion, possibly because they are of an ongoing nature, but if you make progress on them, you will be happy. An important note: the tasks should conform with the sort of person you want to be.